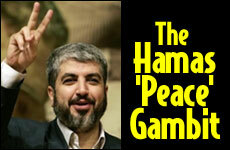 The Times conducted a five-hour interview with Hamas leader Khaled Meshal at his Damascus headquarters. Mirabile dictum, they're offering a peace plan with a two-state solution. Except. The offer is not a peace but a truce that expires after 10 years. Meaning that after Israel has fatally weakened itself by settling millions of hostile Arab refugees in its midst, and after a decade of Hamas arming itself within a Palestinian state that narrows Israel to eight miles wide -- Hamas restarts the war against a country it remains pledged to eradicate. With the 1993 Oslo accords, he showed what can be achieved with a fake peace treaty with Israel -- universal diplomatic recognition, billions of dollars of aid, and control of Gaza and the West Bank, which Arafat turned into an armed camp. In return for a signature, he created in the Palestinian territories the capacity to carry on the war against Israel that the Arab states had begun in 1948 but had given up after the bloody hell of the 1973 Yom Kippur War. Meshal sees the opportunity. Not only is the Obama administration reaching out to its erstwhile enemies in the region, but it begins its term by wagging an angry finger at Israel over the Netanyahu government's ostensible refusal to accept a two-state solution. Of all the phony fights to pick with Israel. No Israeli government would turn down a two-state solution in which the Palestinians accepted territorial compromise and genuine peace with a Jewish state. (And any government that did would be voted out in a day.) Netanyahu's own defense minister, Ehud Barak, offered precisely such a deal in 2000. He even offered to divide Jerusalem and expel every Jew from every settlement remaining in the new Palestine. The Palestinians have never accepted the idea of living side by side with a Jewish state. Netanyahu is reluctant to agree to a Palestinian state before he knows what kind of state it will be. That elementary prudence should be shared by anyone who's been sentient the last three years. The Palestinians already have a state, an independent territory with not an Israeli settler or soldier living on it. It's called Gaza. And what is it? A terror base, Islamist in nature, Iranian-allied, militant and aggressive, that has fired more than 10,000 rockets and mortar rounds at Israeli civilians. If this is what a West Bank state is going to be, it would be madness for Israel or America or Jordan or Egypt or any other moderate Arab country to accept such a two-state solution. Which is why Netanyahu insists that the Palestinian Authority first build institutions -- social, economic and military -- to anchor a state that could actually carry out its responsibilities to keep the peace. Apart from being reasonable, Netanyahu's two-state skepticism is beside the point. His predecessor, Ehud Olmert, worshiped at the shrine of a two-state solution. He made endless offers of a two-state peace to the Palestinian Authority -- and got nowhere. Why? Because the Palestinians -- going back to the U.N. partition resolution of 1947 -- have never accepted the idea of living side by side with a Jewish state. Those like Palestinian President Mahmoud Abbas, who might want to entertain such a solution, have no authority to do it. And those like Hamas's Meshal, who have authority, have no intention of ever doing it. Meshal's gambit to dress up perpetual war as a two-state peace is yet another iteration of the Palestinian rejectionist tragedy. In its previous incarnation, Arafat lulled Israel and the Clinton administration with talk of peace while he methodically prepared his people for war. Arafat waited seven years to tear up his phony peace. Meshal's innovation? Ten -- then blood. Enemies of Zionism - here is the real low down on what's wrong with those racist reactionary Zionists. Don't miss this. A must for every progressive anti-Zionist. Egyptian fantasy: Starbucks must be boycotted because Starbucks logo shows Queen Esther! The Starbucks coffeeshop logo shows a mermaid. This Egyptian cleric insists that Starbucks must be avoided by all good Muslims because its logo shows - Queen Esther! Expensive coffee is not my thing, but really this is absurd. This video, shown on Egyptian state television, is part of the peace dividend. Can Israel expect more such "dividends" as a result of the ongoing peace process? To get this propaganda, is it really a good idea to trade away territory? Is this what "normal" relations mean? Ninety-five Afghan children are among the 140 people said to have died in a recent U.S.-Taliban battle in western Afghanistan, according to a list drawn up by Afghan officials, a lawmaker said Wednesday. The U.S. military disputed the claim. Afghans blame U.S. airstrikes for the deaths and destruction in the villages of Gerani and Ganjabad in Farah province. Sixty-five of the reported victims on the list were female, either adults or children, said lawmaker Obaidullah Helali, a lawmaker from Farah and a member of the government's investigative team. If the Afghan toll is correct, it would be the largest case of civilian deaths since the 2001 U.S.-led invasion to oust the Taliban. U.S. military spokesman Col. Greg Julian said "there is no physical proof that can substantiate" the Afghan list of victims. The U.S. has refused to release a number of people it thinks died in the May 4-5 clash in Farah's Bala Baluk district. President Hamid Karzai has said the strikes were "not acceptable" and estimated that 125 to 130 civilians died. Afghan members of the delegation investigating the clash delivered condolence payments to victims' families Tuesday, Helali said. The payments — $2,000 for the dead and $1,000 for the wounded — were ordered by Karzai, he said. Julian suggested that it is the condolence payments that might be one reason for villagers to report these high numbers. "It's very difficult to determine an exact number and there's a climate that encourages exaggeration," Julian said. Karzai has long pleaded with the U.S. to minimize civilian deaths during its operations. Past incidents have drawn immediate outcries from the government, which contends that such killings undermine support for the fight against the Taliban. The disputed incident comes as the Obama administration is gearing up to roll out a new strategy for the region, which involves linking success in Afghanistan with security in neighboring Pakistan, where Taliban militants are active along the border. The U.S. has also pledged long-term nonmilitary efforts here — for example, civilian expertise in farming and other specialties — along with an increase of 21,000 U.S. troops. The decline of Christianity in the Middle East is often attributed to the Israeli occupation, but the truth is that it pervades every country in the Middle East and has nothing to do with Israel. It has to do with economics, and with differential birthrates, and with people being scared, and justifiably so. Since it was here that Jesus walked and Christianity was born, the papal visit highlights a prospect many consider deeply troubling for the globe's largest faith, adhered to by a third of humanity — its most powerful and historic shrines could become museum relics with no connection to those who live among them. "I fear the extinction of Christianity in Iraq and the Middle East," the Rev. Jean Benjamin Sleiman, the Catholic archbishop of Baghdad, said in a comment echoed across the region. The pope, in a Mass on Tuesday at the foot of the Mount of Olives, addressed "the tragic reality" of the "departure of so many members of the Christian community in recent years." He said: "While understandable reasons lead many, especially the young, to emigrate, this decision brings in its wake a great cultural and spiritual impoverishment to the city. Today I wish to repeat what I have said on other occasions: in the Holy Land there is room for everyone!" On Sunday in Jordan the pope argued that Christians had a role here in reconciliation, that their very presence eased the strife, and that the decline of that presence could help to boost extremism. When the mix of beliefs and lifestyles goes down, orthodoxy rises, he said, as does uniformity of the cultural landscape in a region where tolerance is not an outstanding virtue. A Syrian international aid worker said, "When other Arabs find out that I am Christian, many seem shocked to discover that you can be both an Arab and a Christian." The worker asked to remain anonymous so as not to bring attention to his faith. "Unless there is a turn toward secularism in the Arab world, I don't think there is a future for Christians here," said Sarkis Naoum, a Christian columnist for the Lebanese newspaper Al Nahar. A century ago there were millions of Christians in what is today Turkey; now there are 150,000. There is a house in Turkey where the Virgin Mary is believed to have spent her last days, yet the country's National Assembly and military have no Christian members or officers except temporary recruits doing mandatory service. Violence against Christians has risen. Among Palestinians, Islam is also playing an unprecedented role in defining identity, especially in Gaza, ruled by Hamas. Benedict's arrival in Jerusalem on Monday prompted a radical member of the legislature in Gaza to call on Arab governments not to greet him because of his contentious remark in 2006 regarding the Prophet Muhammad. Rafiq Husseini, the chief of staff of President Mahmoud Abbas's office, said of the exodus of Christians, "It is a very negative thing if it continues to happen. Our task, from the president downwards, is to keep the presence of the Christians alive and well." "Economy, economy, economy," said Fayez Khano, 63, a member of the Assyrian community, explaining the reasons for the continuing exodus while cutting olive-wood figurines in his family workshop on Manger Street. Mr. Khano's three adult children live in Dublin, and since business is slow he and his wife are about to go to Dublin for six months. Many left early in the war when they were attacked for working with the Americans, but the exodus gained speed when Christians became targets in Iraq's raging sectarian war. Churches were bombed, and priests as well as lay Christians were murdered. As recently as March 2008, an archbishop was kidnapped and killed outside the northern city of Mosul. And in Egypt, where 10 percent of the country is Coptic Christian, the prevalent religious discourse has drifted from what was considered to be a moderate Egyptian Islam toward a far less tolerant Saudi-branded Islam, making Copts feel less comfortable in their own country. "Here in Lebanon, Muslims will often tell you Lebanon is no good without the Christians, and they mean it," said Kemal Salibi, a historian. "The mix of religions and cultures that makes this place so tolerant would disappear." This is a continuation of the sad theme discussed here: F-35: Should Israel develop an independent air superiority alternative?. If this report is correct, the State Department and the Pentagon are once again using US military aid to Israel to gain a stranglehold on Israeli security decisions as well as foreign policy. It is intolerable interference with national sovereignty, but as long as the US pays the bill and has a monopoly, Israel has no real choice. It underlines the urgent need for an Israeli alternative air craft that is not dependent on the Pentagon. It is irresponsible for Israel to continue to depend on the United States for vital air defence and deterrent capabilities. This is beyond political maneuvers and differences of opinions. It could really jeopardize Israeli defence. The article is written by someone with little technical expertise. The point of the F-15SE and F-35 is that they are not just "fighter jets." The problem with keeping all the computer technology of the F-35 in the USA is not the long repair time, since in theory the US would provide spare computers. The problem is that they also could fail to provide such spares if Jim Jones or Rahm Emanuel doesn't like something Israel does, and by keeping a stranglehold on the flight control computer, the US prevents Israel from modifying the aircraft in almost anyway, since most modifications that matter would have to be controlled by that flight computer and taken into account by it. If you care about Israel please write to the President and other US officials and tell them not to play irresponsible political games with Israeli security. WASHINGTON — The Obama administration has imposed obstacles on Israeli efforts to procure U.S.-origin fighter-jets. I bet you didn't know this exciting news, right? WASHINGTON (Reuters) - U.S. President Barack Obama will urge Palestinian, Israeli and Egyptian leaders to take the steps necessary to achieve peace in the Middle East when they visit Washington this month, the White House said on Tuesday. The White House said Israeli Prime Minister Benjamin Netanyahu would visit on May 18, Egyptian President Hosni Mubarak on May 26 and President Mahmoud Abbas on May 28. "With each of them, the president will discuss ways the United States can strengthen and deepen our partnerships, as well as the steps all parties should take to help achieve peace between Israelis and Palestinians and between Israel and the Arab states," Obama spokesman Robert Gibbs said. Obama has pledged to make the Israeli-Palestinian conflict a high foreign policy priority for his administration and has dispatched former Senator George Mitchell as a special envoy to the region. The Obama administration has also stepped up pressure on Israel's new government to accept the goal of a Palestinian state and halt expansion of Jewish settlements on occupied land. Since coming to power in March, Netanyahu has balked at recognizing the goal of Palestinian statehood. U.S. officials have so far declined to comment on a newspaper interview in which Jordan's King Abdullah, a recent visitor to the White House, said Obama was drawing up a new peace plan for the Middle East. The Times of London said the peace initiative could form the centerpiece of his major address to the Muslim world in Egypt on June 4. Syria Allied with al-Qaida Against the United States? Might that be a Problem? While the United States has been trying to engage Syria, the Syrian regime has been busily engaging Americans: in battle. That's indirectly of course but it is all part of Damascus's never-ending battle against America. What is spectacularly important—and should be a major crisis with energetic responses by the United States and European countries—is that the Syrians are smuggling al-Qaida terrorists into Iraq. This has been going on for years but when the Bush administration said so the media paid less attention. Now this is not only being confirmed by the Obama administration as happening but it's increasing. Let me repeat this: al-Qaida, which is the Enemy Number One for the United States, remember those people responsible for September 11, is working closely with the Syrian government to murder Americans. Sounds like a matter for high-level concern, doesn't it? More - Syria Allied with al-Qaida Against the United States? Might that be a Problem? Gates said in December that the US was not seeking "regime change" but "behavioural change" in Iran. This line was echoed last week by Senator John Kerry, chairman of the Foreign Relations Committee, who stated that "we [Americans] are not for regime change [in Iran]. Our effort must be reciprocated by the other side. Just as we abandon calls for regime change in Tehran and recognise a legitimate Iranian role in the region, Iran's leaders must moderate their behaviour and that of their proxies, Hezbollah and Hamas". This is exactly what worries the Arabs in the region. What does Kerry mean when he bluntly says he "recognises a legitimate Iranian role in the region"? Why would Iran cave in and acquiesce, and be cooperative and accommodating, if the price was not right? The US has already given Iran the ultimate assurance - that there will be "no regime change". The Americans have to put themselves in the Arabs' shoes and see their dilemma. The siege mentality that has set in does not emanate from speculations but from the situation that is unfolding before our eyes. When the Americans deny something, it is likely to be true. So, should the Arabs in general and the Gulf states in particular be concerned by the ongoing open fist-close fist monologue, which could evolve into a productive dialogue when the interests of Washington and Tehran intersect? Or are concerns about the possibility of a 'grand bargain' between the US and the Iranians unfounded, as Gates and US Secretary of State Hillary Clinton contend? If a US-Iran deal comes through, it will most likely be at our expense. If we do not wake up and get our act together, we will be in for a rude awakening. Then we will have only ourselves to blame. US officials have reassured Gulf and other Arab officials that America's opening up to Iran won't be at the expense of the Arabs because of the historical and strategic ties between the US and its Arab partners and allies in the region. The latest assurance came from US Defence Secretary Robert Gates during his visits to Egypt and Saudi Arabia. He downplayed the thawing of relations with and the cosying up to Tehran, which is keeping Arabs on edge. They fear another betrayal by the Americans if the Iranian price is right. "There's probably some concern in the region that may draw on an exaggerated sense of what's possible. And I just think it's important to reassure our friends and allies in the region that while we're willing to reach out to the Iranians, as the president said, with an open hand, I think everybody in the administration, from the president on down, is pretty realistic and will be pretty tough-minded if we still encounter a closed fist," Gates said. He went on to lament Iran's "closed fist". Gates highlighted the opening up to Iran "for the purpose of improving security throughout the region". In order to reassure those of us in the Arab world, Gates made it clear that "building diplomacy with Iran will not be at the expense of our long-term relationship with Saudi Arabia and other Gulf states that have been our partners and friends for decades". But these reassurances, ironically, seem to strengthen our sense of insecurity and confirm our fears about the prospect of a grand bargain between the two rivals if the price is right - and if the Israelis endorse it, after ensuring that Iran's nuclear programme is discussed. This dialogue could be more direct and gather steam after the Iranian presidential elections on June 12. What is alarming for us in the region is the publication a few days ago of an intelligence report by the US Senate Foreign Relations Committee. The report cites Iran's nuclear progress, and says faulty intelligence was responsible for underestimating Iran's progress towards designing a nuclear warhead before Tehran halted its programme in 2003. The report suggests that the US engagement with Iran must convince Tehran to halt its nuclear programme and accept tough international controls. But what alarms the Arabs are the current geo-strategic realities, which Iran uses for its own advantage and employs to serve its interests and project its power. This is made possible as a result of US miscalculations and through Tehran's proxies in the region. Iran realises that the US is seeking "responsible withdrawal from Iraq". Iran is following the deteriorating security situation in Afghanistan, and is alarmed at the re-emergence of the Taliban. Iran is worried at the situation in Pakistan as the US seeks to stabilise that nuclear state, which has become a major security challenge for the Obama administration. The Obama administration is increasingly engaged in what Richard Hass calls the "war of choice" - that is, the war in Afghanistan, the major frontline in the 'war on terror'. In addition to this, the Obama administration needs Iran to play a constructive role in the Arab-Israeli peace process, and to reign in its proxies in Lebanon and Gaza. All of these regional problems give Iran a strong card to play in its confrontation with the Americans. Dr Abdullah Al Shayji is professor of international relations and head of the American Studies Unit at Kuwait University.